CELEBRATE SPRING! 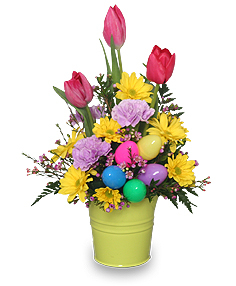 Pave the way for warmer weather with this carefree Easter Praise bouquet from Floral Designs & Gifts. Sending colorful spring flowers is a great way to brighten someone's day. Call direct or order a spring flower arrangement online 24 hours a day! Limegreen Pail, Wet Floral Foam, Foliage: Leather Leaf, Hot Pink Tulips, Lavender Moonshade Carnations, Yellow Daisy Poms, Pink Waxflowers, Plastic Easter Eggs. Giving Beautiful Fresh Flowers Will Fill Her Day with Sunshine and Love. To Send a Floral Arrangement in the Morris, IL area, Call Floral Designs & Gifts Direct or Order Flowers Now from our Website.